Participants in the Bonhams London to Brighton Veteran Car Run make their way through London on Nov. 2, 2014. We could make a case for starting a story on the historical context for the 2015 U.K. general election with the Roman Emperor Hadrian’s decision to build a wall across the neck of Great Britain in the year 122 or with the signing of the Magna Carta in 1215. But we are reasonable people and will try to make do with just the past five centuries. Even that might seem a bit mad — what does the 16th century have to do with the 2015 election? It is not so much that it’s directly relevant, but that it shaped the parties and institutions of the U.K., which are very much at issue. FiveThirtyEight will soon be launching United Kingdom general election forecasts in partnership with me and my colleagues at electionforecast.co.uk. To make sense of those forecasts, and the decisions that we made in generating them, knowing something about the competing parties is important. There are seven parties that are likely to win seats in Parliament representing England, Scotland and Wales (and seven more competing in Northern Ireland). Why is there a nationalist party advocating independence for Scotland and a whole separate party system in Northern Ireland? Why are there two major parties of the left, Labour and the Liberal Democrats, and what distinguishes them? Why are the Liberal Democrats currently in coalition with the major party of the right, the Conservatives? As we will discuss below, during the 25 years after World War II, the U.K. political system looked a lot more like the U.S. political system than it does today; the two-party system began to break down in the 1970s. This has major implications for understanding what’s going on in the upcoming election, as well as for forecasting the results. While this breakdown of two-party politics can mostly be understood in terms of recent U.K. history, some of the background conditions go much further back. What follows is a crash course in the political institutions, political history and current political situation of the U.K. The question of political autonomy for the component countries of the U.K. — England, Scotland, Wales and Northern Ireland — is one of the major stories of the upcoming election. Of those, England is by far the most populous, with 84 percent of the total population, and has been politically dominant for most of the past thousand years. Wales was integrated into the Kingdom of England in 1535 under Henry VIII but had been ruled by England almost continuously since 1282. Six years and three wives later, Henry was proclaimed King of Ireland, which had also been controlled to varying degrees by England since the 1100s. When Queen Elizabeth I died in 1603, the next in line to the thrones of England and Ireland was King James VI of Scotland, who then became King James I of England. Because of England’s relative size, the politics of the U.K. have usually been oriented around the political disagreements within England rather than those among the four countries of the U.K. The political groupings that became the Conservative Party and the Liberal Party emerged from a 19th century realignment of the Whig and Tory parties that developed from the cleavages surrounding the English Civil War (1642-51) and the Glorious Revolution (1688). Major franchise expansions were passed in 1832, 1867, and 1884, greatly reducing the property thresholds for being able to vote, and the supremacy of the House of Commons over the House of Lords in setting policy was established in 1911. This opened up the possibility of a political party oriented toward the working class. The Labour Party was founded in 1900, universal male and partial female suffrage followed in 1918 and equal female suffrage in 1928. In the meantime, the Liberals splintered because of internal rivalries and fallout from having led the government through World War I. Labour formed its first minority government in 1924 but had the bad timing to form its second immediately before the beginning of the Great Depression in 1929, and the Conservatives celebrated a landslide victory in 1931. Conservative governments ruled until World War II, and then a grand coalition of all major parties led by the Conservative Prime Minister Winston Churchill ran the government through the end of the war in 1945. Churchill was turned out of office in a major Labour win just months after victory was achieved in Europe. In the period immediately after World War II, the Labour government created the National Health Service and nationalized a number of major industries. A divide over the scope of government services and taxation defined what was now a two-party system. In all eight elections from 1945 to 1970, Labour and the Conservatives collectively received between 88 percent and 98 percent of the total vote and won nearly all the seats in England, Scotland and Wales. However this two-party dominance gradually began to break down. In February 1974, the Liberals won 19 percent of the vote nationally, up to that point their best performance since World War II. While this translated into relatively few seats for the Liberals — just 14 in the first-past-the-post electoral system — it marked the beginning of the decline in the Conservative plus Labour vote share and the emergence of the Liberal Party. At the same time, the Scottish National Party (SNP) had its first period of success; it won nearly as many seats as the Liberals on less than 2 percent of the U.K. vote, taking advantage of its geographically concentrated support. High rates of inflation contributed to frequent strikes by coal workers and other public-sector unions fighting for wage increases, creating a sense of crisis through much of the 1970s. The February 1974 election was so close that neither the Conservatives nor Labour held a majority of seats, and another election was called in October. Labour secured an extremely narrow majority in the second election. The next five years saw recessions and high inflation. The Labour government lost seats in by-elections triggered by member of Parliament retirements and deaths and by 1979 no longer had a majority. In March, the government lost a vote of confidence by a single MP, and a new election was called, bringing in a Conservative government led by Margaret Thatcher. The early years of the Thatcher government experienced a deep recession as the government tried to get inflation under control at the expense of employment. While this quickly made Thatcher unpopular, the Labour Party was distracted by internal conflicts over its policy positions. Several Labour MPs left the party in protest at what they perceived as excessively left-wing policy positions and formed a new “Social Democratic Party.” (This new party joined an electoral alliance with the Liberal Party, and in 1988,the two merged into the “Liberal Democrats.”) The Conservatives easily won the 1983 election against a badly fragmented opposition and as economic conditions improved. They embarked on privatizing many of the industries that the postwar Labour government had nationalized, including coal, steel, airlines, cars, buses and telecoms. After the Conservatives won the 1987 election with a reduced majority, Thatcher’s popularity began to decline. By most accounts, her downfall was the replacement of local property taxes that depended on property values with a “Community Charge” (commonly known as the “poll tax”), a flat individual charge on all adult residents, regardless of income, to pay for local services. The poll tax was introduced in Scotland in 1989 and in England and Wales in 1990. This led to a lasting sense in Scotland that it had been the subject of a Conservative experiment. When implementation reached the rest of the U.K., large-scale protests and riots occurred in London, and Conservative MPs ousted Thatcher as party leader, replacing her with John Major. The Conservative government rapidly returned to unpopularity, and when the next election occurred in 1997, the Labour Party under Tony Blair’s leadership won in a massive landslide. It is important to note here what a “massive landslide” means in recent U.K. politics. Labour won 43 percent of the vote, versus 31 percent for the Conservatives and 17 percent for the Liberal Democrats. Because Labour won many seats by modest margins, these vote totals translated into 418, 165, and 46 of the 650 Commons seats, respectively. Blair won an equally large victory in 2001 on reduced voter turnout. But as the decade proceeded, Blair’s decision to join U.S. President George W. Bush in the 2003 invasion of Iraq proved to be increasingly unpopular, especially among Labour voters. Blair won a smaller victory in 2005 and stepped aside as prime minister in 2007 in favor of Gordon Brown, the longtime chancellor of the Exchequer. The most recent U.K. general election, in May 2010, took place with an electorally untested prime minister and in the context of the fallout from the war in Iraq and the global financial crisis. Historically, few U.K. parties have led governments as long as Labour had, and when those parties lost power, they tended to lose big. One might have thought the Conservatives were set up for a massive victory. But the Conservative vote and seat count had been depressed since 1997, and even with a gain of nearly 100 seats, the Conservatives secured only 306 on 36 percent of the vote, short of the 326 needed for a majority. 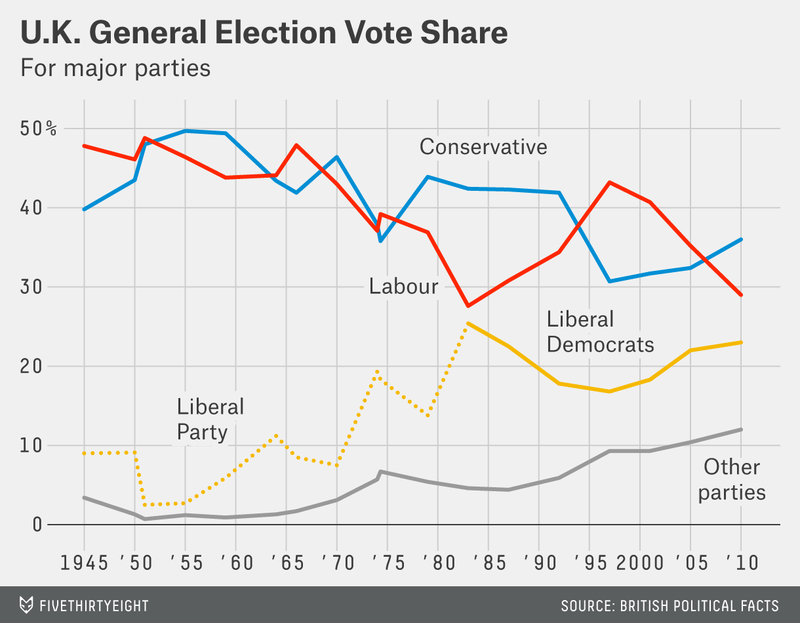 Whereas in the 1950s and 1960s, disaffected voters might have swung from Labour to Conservative and back, across the 2005 and 2010 elections, the Liberal Democrats and other parties gained more than the Conservatives. The Conservatives and Liberal Democrats (who won 57 seats on 23 percent of the vote) formed a coalition government on May 11, 2010, just five days after the election, with most of the Cabinet positions being filled by Conservatives. This coalition was the first since World War II. The alternative would have been minority government, with the Conservatives looking to gain sufficient support on a vote-by-vote basis, rather than by an initial agreement to a shared policy agenda. The Liberal Democrats’ decision to go into coalition was motivated in part by a desire to demonstrate stability in the midst of the economic crisis, and they presented it as the responsible action given that the Conservatives had received the most votes and seats and that a Labour-Liberal Democrat coalition would fall well short of a majority. Within a month, though, the popularity of Liberal Democrat leader Nick Clegg and support for the party in voting intention polls began to collapse. By the end of 2010, the support for the Liberal Democrats had fallen to 10 percent; it has not recovered since. The Liberal Democrats had thrived by being an alternative to two-party politics. Going into government exposed tensions between positions the party leadership was willing to support and what their voters supported. The Liberal Democrats had relied on support from left-leaning voters in constituencies2 where Labour was uncompetitive, from right-leaning voters where Conservatives were uncompetitive, and from disaffected voters everywhere else. This was a lot easier to maintain out of government than in government. The Liberal Democrat collapse has been especially pronounced in Scotland, where the Conservatives are very unpopular. With voters seeming to desert the Liberal Democrats, one might have expected a return to two-party politics. Indeed, the opinion polls of 2011 indicated just that, with Labour and the Conservatives jointly surpassing 75 percent in most polls, a substantial increase from their combined 65 percent in the 2010 election. However, this did not last. Beginning in 2011, the U.K. Independence Party (UKIP), advocating exit from the European Union and a substantial reduction in immigration, began to rise, from winning 3 percent of the national vote in the 2010 election to polling at 15 percent in mid-2013 to consolidating that level of support through 2014. While much of the early support for UKIP appears to have come from disaffected Conservatives, as support for the party grew, it has increasingly drawn disaffected Labour supporters. In the 2014 elections to the European Parliament, UKIP came in first with 27 percent of the vote on low voter turnout. Even though there is little chance that UKIP will match that vote share in this year’s general election,3 the party is one of two major new forces in U.K. politics that will shape the 2015 result. The other major political event of 2014 was a referendum on Scottish independence, held in September. The independence side of the referendum achieved a “yes” vote of 45 percent, a near-miss that sent shockwaves through the U.K. political system. (The campaign against the referendum was jointly run by Labour, the Conservatives and the Liberal Democrats, all of which opposed independence.) SNP was the central force behind the Yes campaign and is polling at similar levels for the upcoming general election. Such a result for SNP would be a substantial increase from the 20 percent that the SNP achieved in Scotland in the 2010 general election. Although 45 percent of the vote loses a referendum on independence, in a highly fragmented party system, it will win most Scottish seats. So the SNP is the other major new force in U.K. politics shaping the 2015 result. The SNP is unlikely to receive more than 5 percent of the U.K. vote. But because its support is concentrated in less than 10 percent of the seats, SNP will probably be the most efficient party at converting votes into seats. Even with the rise of UKIP and the SNP, the prime minister after the coming election will likely either be David Cameron, the current Conservative prime minister, or Ed Miliband, the leader of the Labour Party. No other party will come close to the number of seats that those two will secure. But whether either has a majority, or can easily form one with smaller parties, will depend on a series of constituency-level fights and postelection negotiations. The constituency-level fights will vary significantly in the different regions of the U.K., and the postelection negotiations will occur between parties that have very different priorities. All this makes the election difficult to predict. CORRECTION (March 24, 9:47 a.m.): An earlier version of this article misidentified the United Kingdom of Great Britain and Ireland established in 1801 as the United Kingdom of Great Britain and Northern Ireland. This is a notable election for us as political forecasters because the polls were systematically wrong in the runup to the election. 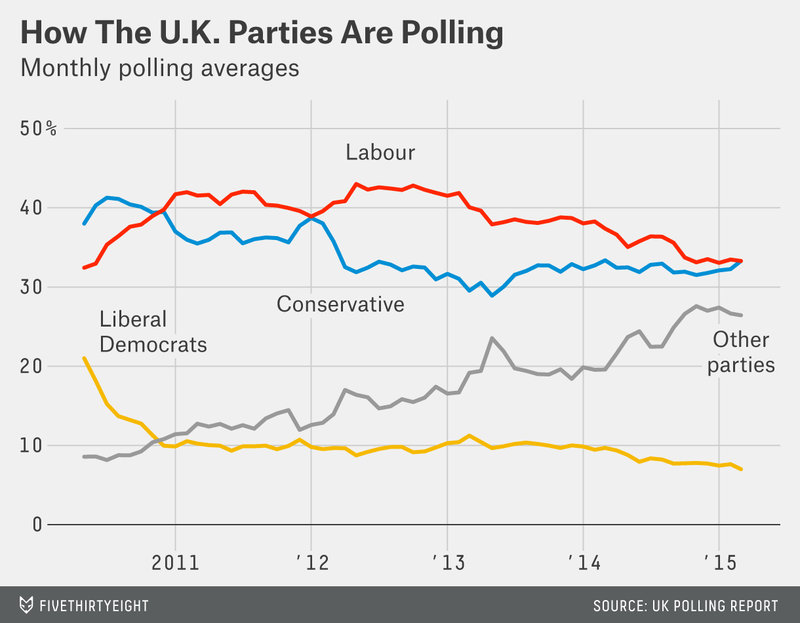 All pollsters had Labour even or slightly ahead of the Conservatives. In in the end, however, the Conservatives won 42 percent of the vote to Labour’s 34 percent. Electoral districts, for U.S. readers. European Parliament elections in the U.K. have a different electoral system (proportional representation by region) and so tend to have higher support for parties other than Labour and the Conservatives. More generally, voters all around Europe use European Parliament elections as an opportunity to punish incumbent governments, and so seldom do their results translate directly into results in the following national elections.